Are French authors read in the United States? Thanks to courageous editors, they are finding their readers. And a handful of titles, in spite of numerous obstacles, even become best-sellers. … Les Etats-Unis constituent, pour la littérature en traduction, ce que la sociologue Gisèle Sapiro nomme "un environnement hostile". Le chapitre qu'elle lui consacre, dans Traduire la littérature et les sciences humaines. Conditions et obstacles (DEPS, 2012), détaille les barrières culturelles et structurelles qui en font une citadelle apparemment imprenable. "Les traductions, écrit-elle, ont connu une marginalisation croissante sur ce marché depuis les années 1970." Elles ne représentent en effet que 2 % à 4 % de la production annuelle, et 1 % seulement de la fiction ! Sur ce segment très étroit, le français reste néanmoins la première langue traduite, juste devant l'allemand. … Quelques succès remarquables, publiés par le secteur indépendant, viennent pourtant battre en brèche l'idée reçue : les ventes de L'Elégance du hérisson (Gallimard, 2006), de Muriel Barbery, devenu The Elegance of the Hedgehog, en 2008, sous la bannière de la maison indépendante Europa Editions, ont aujourd'hui dépassé le million d'exemplaires ! Trois femmes puissantes, de Marie NDiaye (Gallimard, 2009, prix Goncourt), ou HHhH, de Laurent Binet (Grasset, 2010), figurent tous deux dans la liste des meilleures ventes de livres 2012 établie par le New York Times. Mais rien n'y fait : le présupposé est tenace, et il n'est pas rare que les éditeurs s'étant risqués à acquérir les droits d'un roman étranger cachent à leurs lecteurs qu'il s'agit d'une traduction. Ils omettent le nom du traducteur, ou le relèguent en tout petits caractères dans les pages de garde, nous confient plusieurs responsables de cessions de droits, "pour faire croire aux lecteurs que c'est un auteur américain, même si son nom, à l'évidence, ne l'est pas", précise l'une d'entre eux. 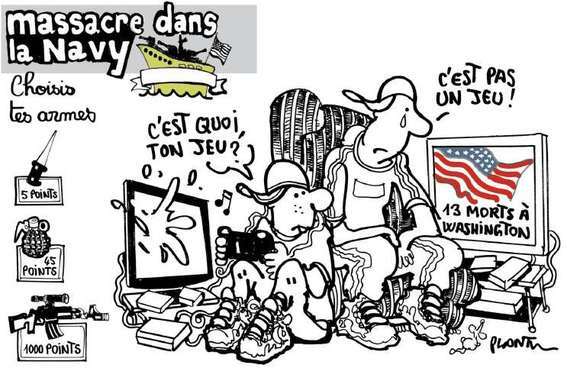 In "Massacre in the Navy", Plantu has one of two kids believe that the tragic news from America may refer to a new video game. • What kinda game is that? • It ain't no game! reports the BBC, as we are witnesses to more repercussions of the Obama administration's unique smart diplomacy. But what with his uncommon powers of persuasion, won't a telephone call from the Apologizer-in-Chief win over Brazil's head of state? The US National Security Agency (NSA) has been accused of intercepting emails and messages from Ms Rousseff, her aides and state oil company, Petrobras. The allegations were based on documents leaked by fugitive former intelligence contractor Edward Snowden. President Barack Obama had promised to investigate the incident. He made a phone call to Ms Rousseff on Monday, reportedly asking her to go ahead with the visit, the Brazilian president's office said. This was to be the first state visit by a Brazilian president to the US since 1995. It was due to begin on 23 October. Second Amendment Re-Written; Now Let's Take On the First! Bryan Preston tells us the tale of how a schoolbook has rewritten the Second Amendment (thanks to Instapundit). On page 102 of Newman’s [textbook, United States History: Preparing for the Advanced Placement Examination] (page 134 of the PDF version), the author cuts the Second Amendment in half and leaves out several key words. Congress shall make no law respecting an establishment of religion, or prohibiting the free exercise thereof, unless the teachings of said religion interfere with the progressives' agenda for the betterment of society and all its members; or abridging the freedom of speech, or of the press unless said speeches and articles aim to oppose the liberals' plans for the nation; or the right of leftist activists to assemble, preferably peaceably, and to petition a rightist Government for redress of anything that can be reasonably or otherwise construed as grievances. Navy veteran Aaron Alexis, who killed 12 people at a Navy building in Washington Monday morning, had been suffering a host of serious mental issues, including paranoia and a sleep disorder, law enforcement officials told the Associated Press. Alexis had been hearing voices in his head and had been treated since August by the Veterans Administration for his mental problems, the officials said. They spoke on condition of anonymity because the criminal investigation in the case was continuing. Oh, and then Aaron Alexis was aware of that cancer in American life (thanks, mainstream media), I am naturally speaking of (dramatic pause…) racism! … While some neighbors and acquaintances described him as "nice," his father once told detectives in Seattle that his son had anger management problems related to post-traumatic stress brought on by the terrorist attacks of Sept. 11, 2001. He also complained about the Navy and being a victim of discrimination. It is easy — for a foreigner as well as for an American (of the liberal bent) — to tout the success of the gun control laws in the rest of the Western world when you ignore the 1996 massacre of 16 children at a Scottish primary school; the 2000 killing of eight kids in Japan; the 2002 deaths of eight people in Nanterre, France; the 2002 killing of 16 kids in Erfurt, Germany; the 2007 shootings to death of eight people in Tuusula, Finland; the killing of 10 people at a Finnish university less than a year later; the 2009 killing of 15 people in Winnenden, Germany; and, needless to say, Anders Breivik's 2011 mass murder of 77 Norwegians, most of them teenagers. It is easier — much easier — to condemn gun violence in America when you ignore, or downplay, gun violence in a foreign country, including not giving a second thought to things such as, say, the widespread presence of Kalashnikovs among France's thugs and criminals. Coddling the mentally ill isn’t even helping the mentally ill. Ask the sisters of crazy homeless woman “Billie Boggs” how grateful they were to the ACLU for keeping Boggs living on the streets of New York City. Ask the parents of Aaron Alexis, James Holmes (Aurora, Colo., movie theater shooter), Jared Loughner (Tucson, Ariz., mall shooter) or Seung-Hui Cho (Virginia Tech shooter) how happy they are that their sons weren’t institutionalized. … Something seems to have gone horribly wrong right around 1970. What could it be? Was it the introduction of bell-bottoms? That date happens to correlate precisely with when the country began throwing the mentally ill out of institutions in 1969. Your memory of there not being as many mass murders a few decades ago is correct. Your memory of there not being as many homeless people a few decades ago is also correct. But liberals won’t allow the dangerous mentally ill to be committed to institutions against their will. (The threat of commitment is very persuasive in getting disturbed individuals to take their medicine.) Something in liberals’ genetic makeup compels them to attack civilization, for example, by defending the right of dangerous psychotics to refuse treatment and then representing them in court after they commit murder. … The disastrous consequences of the deinstitutionalization movement is described in E. Fuller Torrey’s book, The Insanity Offense: How America’s Failure to Treat the Seriously Mentally Ill Endangers Its Citizens . Torrey’s book reads like a compendium of America’s most heinous murders since the early ’70s — all of which could have been stopped with involuntary commitment laws, and none of which could have been stopped even with a complete gun ban. Only after a mass murder committed by a psychotic with a firearm do liberals spring to life and suggest a solution: Take away everyone’s guns. Taking guns away from the mentally stable only makes us less safe: Even psychotics know enough to keep choosing “Gun-Free Zones” for their mass murders. 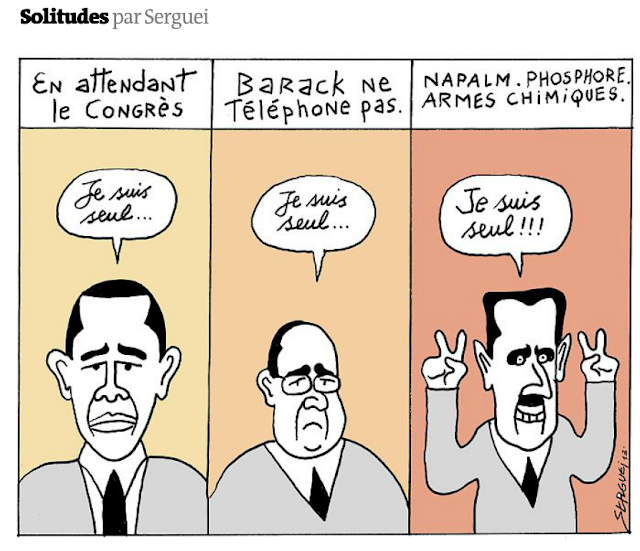 • A jubilant Assad: I am alone!!! John Morris was Life Magazine's London editor in the summer of 1944, apparently the man who managed to save a dozen of Robert Capa's Omaha Beach photos in the London office while the rest of the legendary photographer's D-Day landings shots were lost due to a blunder. 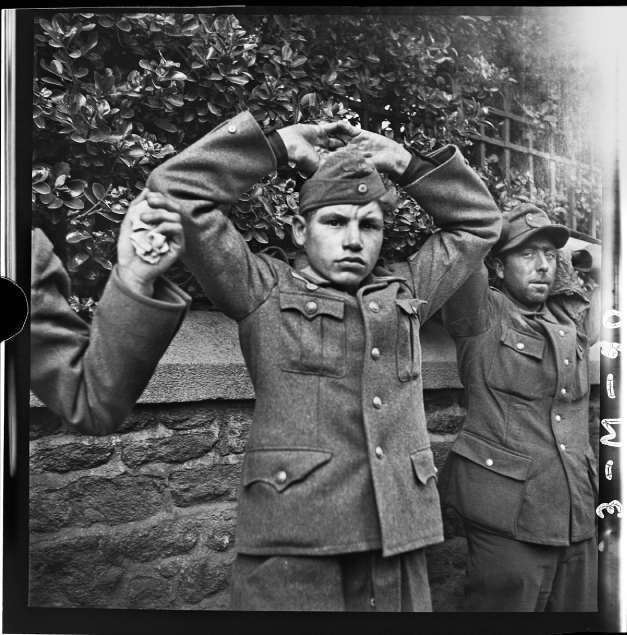 Now 96, his own photos from wartime Normandy — including one of German prisoners (aka members of the Aryan race) in a truck driven by a black American — can be seen at Perpignan's Visa Pour l'Image photo festival, exhibited for the first time ever. "In 1944, I was based in London, but I wanted to see [the war] with my own eyes. I managed to invent myself a job in France, that of 'coordinator of press photographers.' It was pretty ridiculous but that's how I landed on Utah Beach on July 16." The beaches are safe, but there is fighting in the surrounding areas. 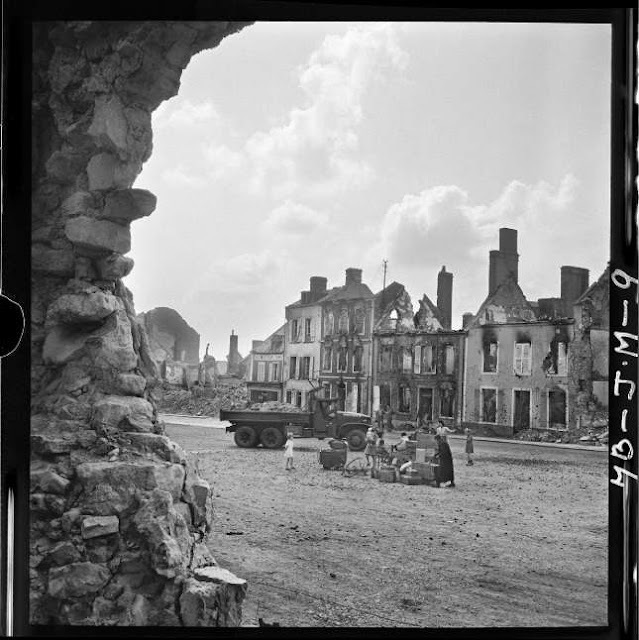 For four weeks, John Morris assists photographers in Normandy and Brittany all the while taking amateur shots with his Rolleiflex for his own sake. "Photographers covered the front. As for me, I photographed the daily lives of the people I saw, I was interested in how the Normans were surviving the war." In these images, we sometimes see Capa at work from the back. These in-sides of the war, away from the bloody battles, give another vision of the months of confusion that followed the landings. In the rear lines, soldiers, resistance fighters, prisoners, refugees and media cross each other's pathes. John Morris shows the confrontation between the victors and the vanquished, photographing German prisoners embarked in a Jeep driven by a black soldier. "En 1944, j'étais basé à Londres, mais je voulais voir ça de mes propres yeux. Je me suis débrouillé pour m'inventer un poste en France, celui de "coordinateur des photographes de presse". C'était assez ridicule, mais c'est comme ça que je suis arrivé le 16 juillet à Utah Beach." Les plages sont sécurisées, mais il y a des combats aux alentours. Pendant quatre semaines, John Morris assiste les photographes en Normandie et en Bretagne tout en faisant des images pour lui, en amateur, avec son Rolleiflex. "Les photographes couvraient le front. Moi, je photographiais la vie des gens que je voyais, je m'intéressais à la façon dont les Normands survivaient à la guerre." Dans ces images, on aperçoit parfois Capa, de dos, au travail. Ces à-côtés de la guerre, loin des combats sanglants, donnent une autre vision des mois de confusion qui ont suivi le Débarquement. A l'arrière des lignes, des militaires, des résistants, des prisonniers, des réfugiés et des journalistes se croisent. John Morris montre la confrontation entre les vainqueurs et les vaincus en photographiant des prisonniers allemands embarqués dans une Jeep conduite par un soldat noir.